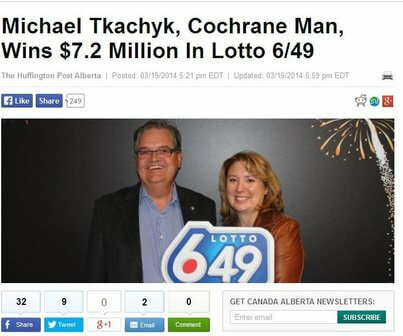 When Michael Tkachyk checked his 6/49 lotto ticket using a ticket checker at a convenience store, he was delighted because he thought he had won $70,000. He went home thinking about what he would do with the money.But he was way off the mark, and didn’t know it at the time. Everything became clear when he received a letter from the lottery. He had actually won $7.2 million. In his excitement, he sent an SMS to asking his wife to call him. She did not reply right away so he had to send two more messages. They have no plans for the money as yet, but both know they want to keep working.